We both love the University during its high-energy moments — crowded hallways and walkways, the chatter on Red Square so loud we have to close our windows to concentrate. Yet, as June rolls around, we look forward to the bittersweet joy of graduations, the warmer weather and quieter times that offer a chance to reflect, plan and relax. Not this summer. Hours after graduates and their families proudly streamed out of Husky Stadium, we heard about the 49 people, mostly Latino gay men, slaughtered in Orlando. Yet again, hours after celebrating on the Fourth of July, there was devastating news of the death of Alton Sterling, followed almost immediately by Philando Castile, killed at the hands of police in Baton Rouge, Louisiana, and Falcon Heights, Minnesota. There was no chance to take a breath or grieve appropriately before news came from Dallas of the five police officers fatally shot. And all this against a backdrop of international terrorist attacks in Bangladesh, Iraq, Saudi Arabia and Turkey, attacks that affect our community as well. Promising lives cut short, families torn asunder, scenes of horrific violence seared into our consciousness, images of children and parents sobbing. We are heartbroken — for the dead and their families, for their friends and communities, for our country and world. It is tempting to feel helpless and hopeless, to look for easy answers, draw a line in the sand and choose sides. But we can’t. And we won’t. 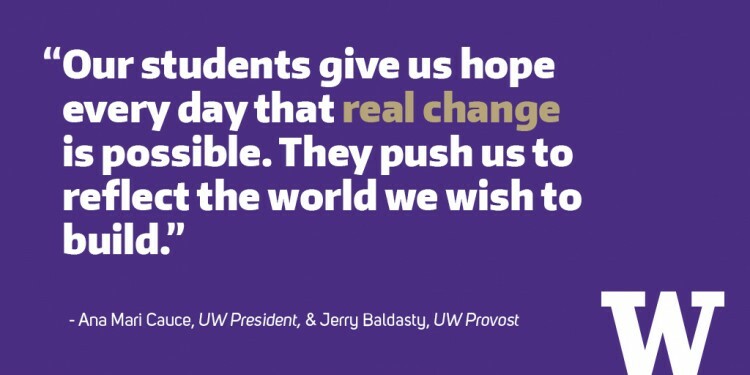 The essence of our mission as a public university is to educate, shape and prepare generations of students not simply to exist in our world, but to create change for the betterment of all. We are driven to take up the biggest challenges we face, whether it’s improving the health of our communities, addressing climate change, healing a nation divided and in crisis, or forging a united path forward. Our students give us hope every day that real change is possible — they challenge us to have difficult and uncomfortable conversations. They push us to reflect the world we wish to build. Our faculty, alumni and many in our community have shown us — both now and over many years — that education, self-reflection and determination can lead to structural, systemic progress. We have not done enough — these heartbreaking times show that clearly — but we cannot let up, even if the path forward is uncertain. The burden of addressing racism and inequity in this country, as well as violence around the globe, falls to all of us. Too often, only those who are its direct victims carry the load. But the burden is collective, and we must, all of us, take responsibility for the environment we are creating. Our students are already getting together in groups to share their sadness and anger. We will work with them to create safe spaces for healing and analysis, and look forward to joint conversations about their, our and the University’s role in standing up to fear and hatred and violence. We are in this struggle together, and our work has never been more important.